Many Americans today are understandably concerned about the state of the economy. The current recession is likely to be one of the worst in recent memory, and comes at a particularly difficult time for many Americans, just as many of the Baby Boom generation are planning to retire. American workers have come to expect stocks, mutual funds, bonds, and other investment opportunities to increase year after year, yet the stock market’s marginal performance over the past few years and the recent instability in the banking sector have made many wonder whether their retirement and savings accounts are safe. Unfortunately, politicians still fail to understand both the origins of economic instability and the proper solution. Rather than getting government off people’s backs, their reflexive reaction is to get government more involved, creating new programs and bureaucracies, implementing new regulations, and spending billions more of the taxpayers’ hard-earned money. Only a sea change in congressional thinking will bring most members around to understanding that the proper way to deal with an economic crisis is to lower taxes, loosen regulation, and keep the government’s hands off the economy. While I am pessimistic about the short term, I am optimistic about the long term. There had been hope in some quarters that a Democratic takeover of Congress would bring renewed skepticism toward, and oversight of, the Federal Reserve System, one of the most pernicious tools used to interfere in the workings of the free market, especially in the financial sector. Unfortunately that has not been the case, as many Democrats have joined Republicans in praising the Fed for its recent interventions into the market. Moreover, Democrats and Republicans have worked in concert to ensure that the unwinding of the housing bubble will be as protracted and painful as possible. For years, the Congress has been instrumental in creating and sustaining the housing bubble. From support of Fannie Mae and Freddie Mac, two unconstitutional, U.S. government-sponsored enterprises that provide funding for mortgage lenders, to the promulgation of the Community Reinvestment Act’s burdensome lending requirements for banks, Congress has firmly enmeshed itself in the housing and mortgage sector. Now that everything is going south, Congress is abdicating all responsibility and placing the blame purely on the private sector. The failure of federal oversight, intervention, and regulation were the primary motivating factors behind the buildup and breakup of the housing bubble, but few politicians today understand or are willing to admit this. From both sides of the aisle we hear calls for increased regulation of the mortgage market, proposals ranging from mandatory background checks, licensing, and fingerprinting of mortgage brokers, to increased federal intervention into, and definition of, acceptable mortgage lending standards. Where federal meddling in other business sectors is concerned, we still have not learned the lessons of the Enron fiasco and of the disastrous Sarbanes-Oxley measures which were passed in response to it. Just about everyone now recognizes just how destructive Sarbanes-Oxley — a cumbersome piece of legislation imposing a range of new auditing and disclosure standards on public companies, ostensibly to prevent more Enrons — was. But while we are lamenting the excesses of Sarbanes-Oxley and introducing legislation to repeal the most onerous sections of it, we are simultaneously introducing and passing legislation which could have a similarly destructive impact on the mortgage and housing industry. I am a firm supporter of regulation — by the market. The market does a perfectly fine job of self-regulation if it is allowed to work free from government intervention. What we have nowadays, thanks to pervasive government controls on business and financial activities, is a system so Byzantine and opaque that no one has any idea what is going on. As Ludwig von Mises, the founder of the Austrian school of economics in the United States, famously demonstrated in Human Action and other works, one intervention into the market begets another, which begets another, and so on until we have full-blown socialism. One of the more worrisome proposals to come along recently has been the Treasury proposal to overhaul the nation’s system of financial regulation. While the Treasury’s plan purports to eliminate certain federal regulatory agencies through mergers and the elimination of duplicative functions, the reality is that it would create the equivalent of the Department of Homeland Security (DHS) of financial regulation. The DHS was touted as bringing greater efficiency to the federal government through its merger of agencies scattered throughout various departments, but it has grown into a gargantuan and all-encompassing bureaucracy. The Treasury’s financial regulation plan would do the same thing, not only with regard to securities and commodities market regulation, but also regarding what the plan envisions for the Federal Reserve. The Federal Reserve, according to the Treasury plan, is to become the guarantor of stability of the financial system, a super-regulator of sorts, despite the Fed’s abysmal track record. The Federal Reserve has been fully complicit in the creation of the housing bubble, as it has been in the creation of every asset bubble in our country’s history since 1913. All you have to do is take a look at the statistics on the money supply, the producer price index (PPI), or the consumer price index (CPI), and you can see that the Federal Reserve has been totally ineffective in combating inflation. In fact inflation — which is defined as an increase in the money supply — is caused in the first place by central banks like the Federal Reserve. Rising prices are the effects of inflation, not inflation per se. The Fed’s real purpose is to ensure that inflation continues at a pace fast enough to benefit the government and the first users of newly created money (like commercial banks and government contractors), while inflating slowly enough to keep the general population from becoming overly concerned. Of course, when I attempted to bring this up with Chairman Ben Bernanke or former Chairman Alan Greenspan, I never received a straight answer. In too many instances, the Federal Reserve acts as a foil for the Treasury Department. If you ask the Treasury about the weakness of the dollar, they will refer you to the Federal Reserve, since they are responsible for the money supply. But when you ask the Federal Reserve, they claim that the dollar’s strength on currency markets is the responsibility of the Treasury Department. By any measure, the Federal Reserve in recent months has performed even worse than usual. Since last August we have seen the Federal Reserve introduce a number of novel measures aimed at stabilizing the financial sector. The current situation Chairman Bernanke is in is akin to the little Dutch boy plugging the dike, but each time he plugs one hole a new one opens up. At first the so-called discount rates were reduced, lessening the interest rate penalty for borrowing directly from the Fed. It’s important to remember that discount window lending is the “lender of last resort” function of the Fed, and historically has been frowned upon. Borrowing directly from the Fed indicates that a bank is in dire financial straits and cannot borrow funds from other banks. To encourage banks to borrow from each other and to discourage them from coming to the Fed, the primary discount rate is set at a higher rate than the federal funds rate (the rate of interest that banks charge for loaning funds to each other). Once the discount window rates were lowered to be closer to the federal funds rate, there was less of a disincentive to borrow from the Fed. Borrowing through the discount window jumped briefly and then declined, and the Fed thought the situation seemed to be under control. Further increases in discount window lending in late 2007 led to the introduction of the Term Auction Credit Facility (TAF), a brand new medium for creating money by auctioning 30-day term funds or repos, which was launched in December. These repos (financial shorthand for repurchase agreements, debt that the borrower agrees to return to the lender at a premium after an agreed-upon time interval) are longer-term than those the Fed has traditionally used in its open-market operations and are merely another roundabout way of pumping more money into the economy. Since the creation of the TAF, we’ve seen the Fed embark upon other novel avenues for money creation, including permitting investment banks to borrow from the Fed, the introduction of the Primary Dealer Credit Facility, and the creation of the Term Securities Lending Facility. This last facility allows the Fed to swap Treasury securities for ostensibly AAA-rated asset-backed securities, which have been expanded to include securitized credit card debt, car loans, and student loans. Chairman Bernanke has all but admitted that the Fed is grasping at straws, developing new and novel instruments by which to prop up banks which are either insolvent or about to be. Even with these new programs, the amount of borrowing from the primary discount window is now nearly five times as much as last summer’s peak, and the amount of intervention through all of the Fed’s new facilities continues to increase. The Fed is clearly worried that despite the hundreds of billions of dollars they have pumped into the system to add liquidity, the problem has still not worked itself out. I have always been a proponent of allowing economic bubbles to liquidate naturally. The best thing the federal government can do when a bubble is burst is to stand aside, enact no burdensome new laws, cut taxes, cut government spending, and cut job-killing regulations. Bubbles originate with the Federal Reserve’s interest rate manipulation and loose monetary policy, which always lead to malinvestment — that is, fundamentally unsound investment that would not occur under normal market conditions. Once the bubble bursts, rather than allowing these malinvestments to liquidate, the Federal Reserve embarks on a policy of reflation, fighting one bubble by creating another. By not allowing liquidation of the bubble, the Fed only ensures that the next crisis will be worse than the first. There is a limit to the Federal Reserve’s largesse, however, as even the Fed has only a finite amount of assets. The swapping of Fed-held Treasury debt for worthless mortgage, credit card, or car loan debt cannot go on forever. What is happening in the markets today is nothing less than a bailout. The Fed’s actions, and indeed most of the federal government’s recent actions, create a massive potential for what economists call moral hazard, the tendency for people to act less prudently when they know they will be shielded from the consequences of their actions. The Fed’s traditional Humphrey-Hawkins mandate of full employment and price stability has been superseded by the expectation that the Fed will bail out distressed sectors of the economy in the event of an economic downturn. The obvious result of this is that financial market actors will continue to undertake progressively riskier investments with the expectation of a government bailout during a downturn, since the precedent has already been set. It used to be that we speculated that the government-sponsored enterprises, Fannie Mae and Freddie Mac, would be bailed out, but the Fed has now gone one step further and is bailing out commercial and investment banks through its lending facilities, and assisting with the JP Morgan takeover of Bear Stearns. For years, investment banks rode the wave of financial euphoria, benefiting from the Federal Reserve’s loose monetary policy and treating their executives to lucrative bonuses. Now that their unsound investments are unraveling, they are unwilling to accept losses, and look to the Fed for a bailout. The American people are rightly upset that their tax dollars are being put at risk to bail out investment banks that are unwilling to take responsibility for their risky investments. When you look at the current situation — the state of our economy, the views and actions of most of our politicians, and where things might be headed — it is very easy to fall into despair. But on the whole, I am quite optimistic about the future. In my travels around the country over the past year, I have had the opportunity to speak to thousands of people, and was pleasantly surprised to see how many people understand monetary policy and are beginning to speak up and demand that the Fed not continue to inflate the currency and weaken the dollar as it has for decades. When I see so many young people who understand that Social Security is bankrupt, that they will not receive as much as they pay in, if anything at all, and who are willing to speak out, I cannot help but be amazed. Youth, energy, and the incredible organizational capabilities brought about by the Internet mean that previously unspeakable topics, the “third rail” topics, are coming to the public consciousness. This is the great power of the Internet, its ability to revolutionize public discourse and subvert both overt and covert attempts to stifle free expression. This is also one reason I have been so adamant about keeping the government out of the business of regulating the Internet. Governments throughout history have attempted to monopolize the flow of information, and the Internet threatens that monopoly. Behind much of the rhetoric we hear from those who want to control the Internet about child protection, the threat of online terrorist networks, or the danger of Chinese hackers lies a desire to control the flow of information and ensure that the dominant modern political and economic orthodoxy reigns supreme. On the Internet today, it only takes a few clicks of the mouse to access the writings of Thomas Jefferson, James Madison, Friedrich Hayek, or Ludwig von Mises, among others. To some people the sheer volume of information available can seem mind-numbing at times, but it is far preferable to the alternative of a government-controlled or -monitored Internet. Thanks to the Internet, more Americans than ever are waking up to the reality of the Federal Reserve’s poor stewardship of the dollar, the steps being taken to create the NAFTA Superhighway, and dangerous plans to erode American sovereignty. Government accords and statements, once publicized, can be disseminated within minutes to millions of people. Websites and blogs serve as an alternative source of news, publicizing stories and opinions that are overlooked by traditional media. Meetup groups, money bombs, and similar concepts make it far easier to organize and fund meetings, campaigns, and rallies, overcoming many of the hurdles to collective action. In many ways, the Internet is truly the last frontier in which Americans can unleash the entrepreneurial spirit which made this country great. When I look at our young people, I see great hope for the future. Today’s youth understand the problems that face us today and, more importantly, they understand that they will be the ones to pay for the mistakes of current failed economic policies. Pundits have always downplayed the role that young people play in the political process, but I see this gradually changing. This current electoral campaign has shown clearly that young people are unhappy with the status quo and want to see real change. Thanks to the proliferation of freedom-minded academic organizations and the use of the Internet to broaden exposure to the ideas of liberty and free markets, more young people than ever are becoming familiar with Austrian economics and other free-market schools, questioning the prevailing Keynesian orthodoxy in academia and the economic illiteracy that pervades much of contemporary mainstream discourse. These young people are organizing grass-roots political campaigns, getting involved in fundraising, and raising the visibility of the ideas of freedom and limited government. They will be the future leaders of our country, the future CEOs, congressmen, and professors. These young people are the future of our nation and will form the core of a movement that will return this nation to the limited constitutional republic that our Founders ordained for us. 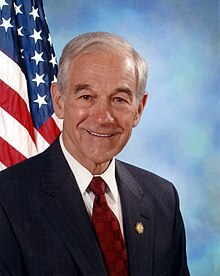 Ron Paul, a 10-term congressman from Texas, serves on the House Financial Services, International Relations, and Joint Economic Committees. He is the author of The Revolution: A Manifesto, which is currently on the New York Times’ best-seller list.